Alure was founded by Sol Hyman as a paint company in 1946 and has evolved into one of the largest remodeling firms in the country by focusing on the customer experience. Sol learned wallpaper hanging from his brother in law before WWII, and after the war began his own business. It remained a 1-3 person paperhanging business until 1971. Throughout high school and college, his son Carl worked part time in the business to support himself. In 1971 after graduating from C.W. Post College, Carl entered the business full time as a partner. The business then incorporated wallpaper removal and interior/exterior painting with its core paperhanging business. In 1976 Bob Hyman, Sol’s other son, entered the business. 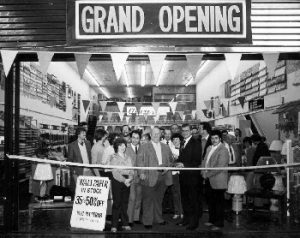 Within a few years after Carl joined the company, Alure was one of the first companies on Long Island to offer “pressure washing and steam carpet cleaning.” Business grew rapidly and at their accountant’s suggestion, Alure opened a retail paint and wallpaper store, which was immediately successful due to the ability of Alure to purchase its paint and wallpaper wholesale from manufacturers. As Alure painted the interiors of homes, they recognized that clients were also in need of window treatments, carpeting, flooring, draperies and other related decorating items. Alure added these items in the late 1970’s and grew to have 5 interior designers on staff to aid their clients in their selections. Alure was the first “deco-center” on Long Island, a deco center being a paint and wallpaper store that also provided decorator service and products. In the late 1970’s, Alure recognized that many of the aging homes on Long Island were in need of new siding and windows. Hence Alure got into siding, windows and roofing as well. As the recession of the late 1980’s through the early 1990’s took hold, Carl, Sol and Bob sensed that the landscape of retailing decorating products such as paint, wallpaper, carpet and window treatments, was in the process of consolidation and change. Large regional and national chains that would have much greater purchasing power and hence be able to undercut Alure’s price would soon become a reality. At that time, Alure was constructing a new building as well as reinventing its business model. For the first time in its history Alure was losing money. Carl knew that installation services are a very personal and detailed hands on experience and he wisely choose to have Alure concentrate on its installed home remodeling services. Carl knew that the vision of Alure’s new business model would be successful as soon as the economy turned around, as long as all the right pieces were in place. They worked 7 days a week and reinvested previous profits. Sadly, Sol passed away in 1991. Sal Ferro, who joined Alure in 1988 as an assistant production manager, demonstrated to Carl and Bob that his work habits, dedication and loyalty were to be relied upon as he rolled up his sleeves and did the critical things that were necessary at the time. As Carl likes to say “we worked 7 days a week for 3 years, for the pleasure of taking no salary and reinvesting $150,000 into the business.” Carl did whatever it took and he hired talented people with the skills to bring Alure to the next level and be prepared for the recessions end. In 1997, Owens Corning approached Alure and shared the concept of a new product to revolutionize basement wall finishing. Alure developed the first generation of Sales, Marketing and installation techniques and persuaded Owens Corning to develop an entire franchise network around this revolutionary system. According to Dave Brown, former CEO of Owens Corning, “Owens Corning would not be in the successful basement franchise business if not for Sal Ferro, Carl Hyman, and the Alure team.” Alure was the first ever franchise authorized to install the Owens Corning Basement Finishing System and we are the areas exclusive installer for the Owens Corning Basement Finishing System, the Owens Corning SunSuites and Windows. Ferro was appointed Vice President in 2001 and was appointed President less than a year later in 2002. Sal was running the company after 9/11 and he did a fabulous job of inspiring our team to keep positive and to remain positive when in the presence of our clients. He laid out the steps necessary to make sure that the immediate impact of 9/11 did not become a long-term malaise. With Carl’s help, he lifted everyone’s spirits and was a beacon of strength. Carl recognized Sal’s remarkable ability to inspire and influence others in a positive way. Realizing the potential with such a foundation in place, the reigns were handed over to Sal to run the company day to day, and thus, the Ferro era began. Alure experienced some remarkable growth over the next 5 years, growing sales from about 23 million in 2003 to 50 million in 2007, all the while maintaining an excellent track record in customer service as evidenced by the continued repeat and referral business, records with the BBB and Consumer Affairs, repeated recognition by Owens Corning for Excellence in Customer Service as judged by feedback from Alure customers, as well as many other awards and industry recognition. In 2001, Ferro had a defining moment at a week long training seminar with Raving Fans author Ken Blanchard, when he wrote the Alure vision statement, a 70 word ode to a culture of customer service, high ethics and superior results. Alure also virtually doubled the number of employees, from around 50 to 98 over the same 5 years, and continues play a major role in the Long Island economy, employing about 100 in house employees, another 200 plus contractors/installers and contributing the local economy with purchases of materials, labor, vehicles, events, sponsorships, advertising and much more. 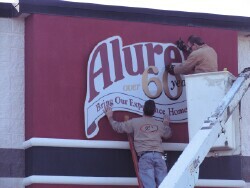 The growth was due in part to the addition of new products and services, expanding into some additional territory, but more than anything, it was a reflection of continued repeat business and referral business generated as a result of Alure’s relentless commitment to delivering superior customer service and continuing to expand on Alure’s already remarkable reputation. During this time, Alure also expanded their core exterior and kitchen and bath services into other counties including the five boroughs, Rockland and Westchester. As Ferro continued to lead the growth and build a culture of employees committed to excellence, the industry continued to take notice. Ferro was often sought after by industry groups to speak to other remodeling owners around the country and to help an industry struggling with a consumer image of negativity build a positive culture. Diversification has also been a key focus of Ferro’s, to continue expanding the services offered to their clients to leverage a growing base of satisfied customers, as well as to protect the overall company from ups and downs in specific specialty areas. This strategy has also continued to provide growth opportunities for Alure’s employees as Alure as added department and territories. 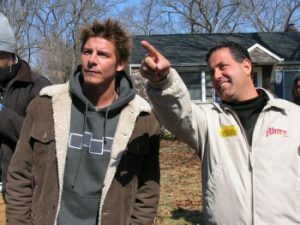 In May of 2004, the Senior Producer of Extreme Makeover: Home Edition, Conrad Ricketts, contacted Sal Ferro and asked if Alure would be interested in performing an extreme renovation for the show’s first ever project in New York, an apartment makeover for two NY Firefighters, Pete Wasserman and Joe Licelli. Unlike the traditional week long home makeover, this was a 12-hour marathon remodel of a NYC apartment. Not very sure of what we were getting into, we accepted, and the beginning of a historic relationship was formed. Alure has gone on to lead another 7 makeovers in the New York area, including sending a crew of 22 down to New Orleans for the Nationwide Coalition of builders project, as well as sending a team of 20 to Baltimore to help out another remodeler in trouble. 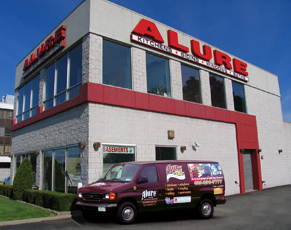 Alure has led makeovers in Long Island (2), Queens (2), Westchester, Putnam, NYC and New Orleans. For more information visit our Extreme Makeover: Home Edition page. Between 2005 and 2010, Alure responded to customer’s needs by adding additional services often being requested by Alure’s customer base. Additional products and services offered include the Owens Corning SunSuites Sunroom, in response to customer’s needs for additional living space providing another alternative to add more living space in just a few weeks. In 2006, Alure opened our Home Performance Division and was one of the first remodelers on Long Island to join the green movement, focusing on helping homeowners save money, improve the efficiency and safety of their homes, all with a focus on saving our precious environment. Alure partnered with Nassau County in Long Island’s first green initiative, Green Levittown to help reduce the carbon footprint on Long Island, and is also a member of Green Street Long Island, whose mission is “to save homeowners money and energy, and protect Long Island’s future.” As part of the Home Performance Division, Alure became BPI certified and began to offer Home Energy Assessments, Air Sealing, Attic and full house insulation. In January 2006, Alure relocated to our current Headquarter location in Plainview, to a 35,000 square foot office/warehouse. The larger warehouse and additional office space allowed us to better service our customers with quicker highway access, the ability to maintain a larger inventory of products and the facilities to improve our call center and training operation. 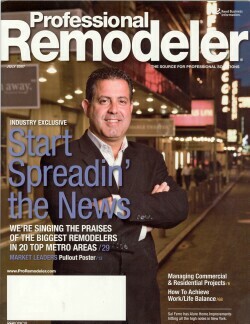 Shortly after in 2007, Alure reached $50,000,000 in installed projects, a major accomplishment for a local remodeler. 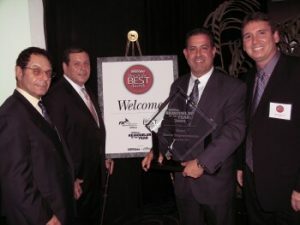 In May of 2008, Alure and Sal were awarded the Fred Case Remodeling Entrepreneur of the Year Award, which recognizes the entrepreneurial spirit of remodelers and the importance of creativity and innovation in the industry, a prestigious award in the remodeling industry. In July of 2009, Owens Corning, the world’s largest manufacturer of building materials, and already one of Alure’s product manufacturers, request to have Sal Ferro as their online video host. Ferro is also the online video host for Computool, one of the industry’s leading database management software programs, and was selected to represent in the National Kitchen and Bath Association industry ad campaign designed to highlight the benefits of dealing with association members. In August, Alure partnered with Habitat for Humanity ReStore program to donate old kitchen materials on Alure projects, which are then used by Habitat for Humanity to raise funds for the their building projects. Alure was featured performing renovations on the Green Room at the Henry Miller Theatre, on a segment for the Rachel Ray show that aired on, Oct 14th, 2009 on ABC and Alure’s Kitchen Designer, Marilou Arcuri, was a special guest on the Martha Stewart Radio show. In early 2010, after numerous appearances on various TV shows, Ferro launched his own radio show on WHLI, “Home on Long Island”, where he had weekly guests and talked about all facets of home improvements ranging from gardening, to landscaping to insulation and more. Guests included Bruno Gervais of the New York Islanders and Jed Morey, publisher of the Long Island Press. In June 2010, Extreme Makeover, at the encouragement of Alure, came back to Long Island. Alure led their eighth project for the show. Alure’s involvement into Social Media starting in 2009 played a key role, as Alure was able to utilize their fan page to recruit volunteers and keep the Long Island Community involved throughout the entire process with pictures, videos, and updates and engaging in dialogue with the community. Following the successful use of social media for volunteer recruitment for the makeover, Ferro and Alure’s Director of IT where invited by New Marketing Labs to speak. While continuing to navigate through a challenging economy, Alure also maintained its ranking by Qualified Remodeler as the 11th largest remodeler in the country in 2010 and was again recognized in 2010 for a continued focus on Customer Service, with the Owens Corning Customer Service Excellence and Angie’s List Super Service Awards. Between 2010 and 2011, Alure has added two new divisions in response to customer demands. We implemented a Handyman Home Service division to handle any size home improvement project and we added an Aging in Place department to accommodate seniors with a walk in tub option. Even though Extreme Makeover has come to an end, Alure still continues to give back to the community and lend a helping hand. We believe we have to respect where success comes from . . . and that’s from the community we work in. It’s about “doing the right thing for the right reasons,” not always looking for a return on investment. Between February and May 2012, we helped out two Long Island families, whiz kid Samantha Garvey and 15 year old Andrew Rosa. Alure was proud to donate a new bathroom and roof for the Garvey family. We teamed up with NARI’s Long Island chapter to build an extension with two bedrooms and a universal design bath for the Rosa Family to be able to accommodate Andrew’s hospital equipment. 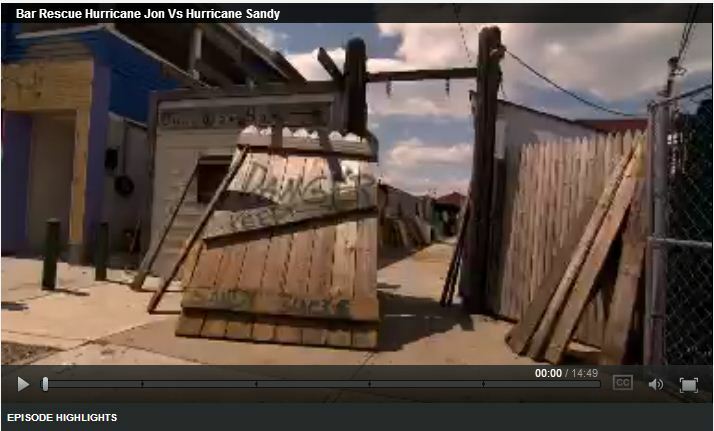 Alure was hired to team up with Jon of Bar Rescue to help a local deserving family get their business, The Bungalow Bar in Rockaway Beach, NY back up and running after the destruction of Hurricane Sandy. To see the transformation, check out the episode. Sal Ferro was honored with the Long Island Business News (LIBN) CEO Awards in May 2013. Sal was recognized for navigating Alure Home Improvements through a tough economy and continuing to maintain Alure’s commitment to the community and delivering exceptional customer service for the Long Island community. His customer service attitude goes further than just the community, but to his employees as well. Ferro believes that “the key to a successful company is its people.” He strives to maintain a team atmosphere that focus on the culture. To create raving fans, you need to start with your internal customer, the employees, and then it is easy to create raving fans with your external customers. In Hofstra’s Advertising Club, run by with Professor Linda Evans, Sal Ferro, President & CEO and Seth Selesnow, Director of Marketing spoke to college students about Alure’s marketing strategies and their involvement in the community. Alure and Sal Ferro took part in the 10th Annual Long Island Fight for Charity to raise money to help individuals and families in need on Long Island! This year was the year that they broke all previous records for fundraising totals to help some great Long Island charities. The previous record for funds raised by any one boxer participating, was $45,000. Sal “The Hammer” Ferro crushed that record, raising close to $80,000 with a combination of sponsorships, donations, ticket sales and a few guest bartending fundraisers along with the way with good friend, Hall of Famer Clark Gillies. The Fight For Charity also broke their overall fundraising record with most money raised! Kitchen & Bath Designer Sherry Gossett who was awarded the Silver Winner of Residential Kitchens for her Excellence in Design at the 2013 NARI CotY Awards held by the NYC/LI Chapter of the National Association of Remodelers (NARI). Alure Home Improvements was also awarded as Contractor of the Year. Alure Home Improvements was named the #1 full service remodeler in Remodeling Magazine’s annual list of the Five Hundred Fifty and moved up one spot on Qualified Remodeler Top 500 list to be the #14 Remodeler in the United States in 2013. On April 16, 2014 Professional Remodeler asked our COO Doug Cornwell to come and speak at their leadership tour about Technology in the Remodeling Industry. Alure and Sal were honored with a few special awards including the Long Island Association Humanitarian Award for the dedication and commitment to the Long Island community, the Association of Fundraising Professionals Outstanding Corporation Award, as well as being honored by the Long Island Press in their PowerList Hall of Fame. The creativity of our designers makes Alure a unique choice as they not only listen to your wants and needs, but they are able to bring those dreams into reality. The 2014 Chrysalis Awards were a big deal this year for us as two of our outstanding designers won for their superior design and functionality of a new kitchen and their multi-functional basement design. 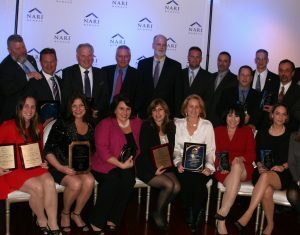 The icing on the cake, was at the NARI Contractor of the Year Awards held by the NYC/LI Chapter where we walked away with 4 awards! Giving back to the community in which we are apart of is a huge part of Alure’s commitment. In 2015, we took part in the Last Hope’s animal rescue luncheon. Last Hope is dedicated to the rescue and rehabilitation of the death-due pound, stray and abandoned animals. BLI hosted the Cohen Children’s Medical Center Radiothon where the support and donations directly impacts the children and families that depend on the care Cohen Children’s Medical Center provides. 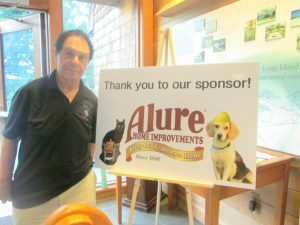 Alure was proud to help spread awareness with their sponsorship and donation to such a worthy cause. The Houzz community also voted Alure as a winner of their Best of Houzz 2015 Awards in the customer service category for the highest level of client satisfaction. Instead of putting his boxing gear back on, Sal “The Hammer” Ferro decided to be the master of ceremonies at the Long Island Fight For Charity for the second year in a row. Alure wanted to continue to help raise funds for the Long Island community and through this wonderful event, he welcomed the opportunity to MC the night. 2015 also brought new opportunities for our design team. 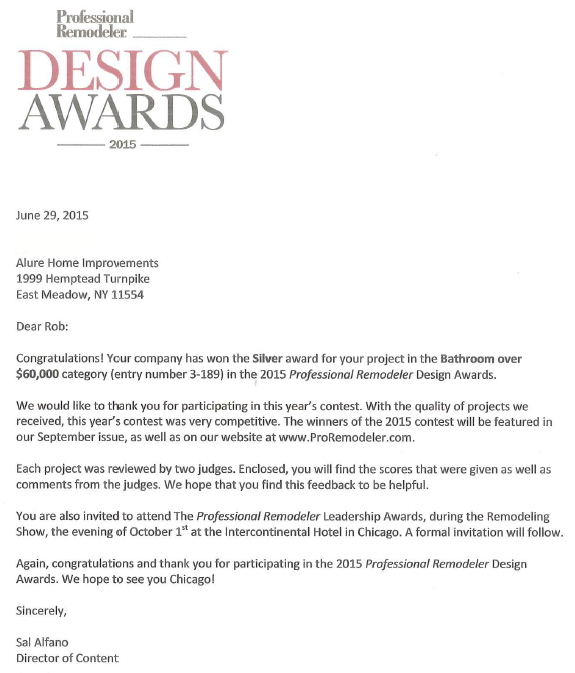 Teressa Rose, one of our talented Kitchen and Bathroom designers was able to blow away the judges and come home with not only a 2015 Chrysalis Award for her zen bathroom remodel, but also earned herself a 2015 Professional Remodeler Design Award. We are proud to announce that Long Island Builders Institute (LIBI) elected it’s 2015 board of directors and officers and Sal Ferro was appointed as secretary. Sal has also appeared as a guest judge at Sacred Heart University as the Jack Welch College of Business(WCOB) presented their plans for a new business. After each presentation, the students had to answer questions—in a Shark Tank-like format—from a panel of guest judges. Sal Ferro was also a panelist at the National Kitchen and Bath Association (NKBA) Metro New York Chapter. The topics discussed were will you be in business in 2020, price is “a” thing, not “the” thing and a happy customer is your best investment for the future. After 72 years, Alure remains a family business and is proud of our friendly and knowledgeable and creative design team, meticulous installers, and superior customer service. Alure President/CEO Sal Ferro, has maintained a culture of teamwork and commitment to customer service excellence, while maintaining the family business feel and personal attention. Ask anyone at Alure about what makes us so special, and you’re sure to hear the same common theme: the people and the culture. Alure has a “people first” approach and recognizes that happy employees are more likely to result in happy customers. Alure’s historically low turnover is a testament to how much people enjoy working here. Of 84 current employees, 54 of them have been with the company for five years or more, 33 have been with Alure ten years or more, astounding numbers for an industry in which more than 50% of companies are out of business within 5 years. Click here to learn more about what makes Alure so special.